My first project with Moda Bake Shop is entitled Pinwheels in the House! I came up with this idea while thinking about mixing different traditional block patterns together, and was struck with the thought of pinwheels mixed with log cabins...get it? Pinwheels inside log cabins... pinwheels in the house?! I just love it! 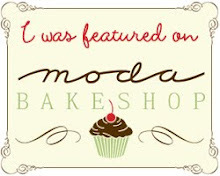 Head on over to Moda Bake Shop and check out my very first pattern-tutorial with them! I'd love it if you'd leave me a comment over there (and here too if you'd like) and let me know what you think! Okay, so I know I said I'd be able to reveal one of the top-secret projects in about a week's time (which would be today) but unfortunately you're going to have to wait another week...I know, I'm sorry! Things had to be pushed back because of some other thing, but it will most definitely be revealed on the 24th. I know...bad Kaye! I've been working on some other projects lately that I can't share too, but I can show you what's been on my needles lately. I don't really talk about it much here on the blog, but I can knit...not overwhelmingly well, but I can. This is just an easy, chunky ribbed scarf that I'm making for either myself or Alex...haven't decided yet...but quite possibly for me since I love grey! I also bought some yarn over the weekend for a couple of pattern I recently bought. The small ball on the bottom is Patons Shetland Chunky in Earthy Brown and the larger ball is Lion Brand Wool-Ease Thick & Quick in Charcoal. The colour of the Charcoal was very hard to photograph (I don't even think the Lion Brand picture does it justice) but I really like it! The Patons is going towards these mittens for Alex, and the Lion Brand is going towards this hat for me. Both of these patterns are by super-talented (and Canadian) Jane Richmond - I just love her designs and if I work up the nerve I'm going to try my hand at her Oatmeal Pullover...trust me, the hat and mittens are going to be a challenge for me, but luckily I have Erica to help me (I *heart* that girl)! I almost bought the yarn for the pullover too, but restrained myself! 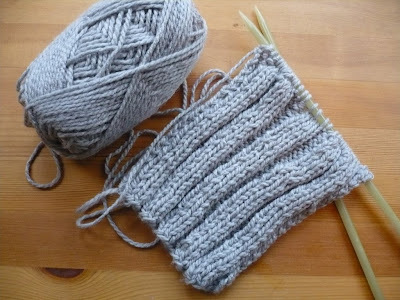 I also have plans to knit the honey cowl from Madelinetosh and will used the Madelinetosh Tosh DK in Composition Book Grey. Amanda (mrsmcporkchop) and I were talking about it via email the other day and she made me want to make it even more than I already did - she's doing hers in a lovely golden honey colour. Work had stalled on the pieced centre string blocks I'm making using my tutorial because of the other projects I have to get finished, but here are the blocks I have so far. I need a lot more, but they're coming along! Okay, since you're going to have to wait until next week now to see the first reveal, I'm going to leave you with a little snippet of what I'm working on right now for my next super-secret project/reveal. Ohhhhh, I forgot to mention that my new laptop arrived yesterday and I looovvveee her - she's awesome! Okay, bye for now! Hey all! I didn't mention this last month because I was a little sad, but my pet fishy, Uther Pendragon, passed away in July. We don't know exactly what went wrong, but we got a few ideas talking to a guy during our recent visit to the pet store. Why were you at the pet store you ask? Well, let me introduce you to Robert Frost! (Sorry for the camera reflection...gee it's hard to take a photo of a fish in a bowl!) Isn't he pretty? He's a very friendly fish and that's why I picked him. Alex left the name up to me and I was originally going to name him Gilmore (hah, get it? Gil...more...gosh I kill myself!) but when I looked at him he made me think of Robert Frost and since Frost is one of our favourite poets that's what we went with. Robert Frost is pretty awesome, eh? Okay, I'm talking about the poet now not the fish; I think my favourite poem of his is Acquainted with the Night. Alright, I know I'm annoying you all with my constant references to super-secret projects but no information... so here's a little sneaky-peeky of something that will be revealed in about a week or so. Ohhh, pretty Verna! Yup, all will be revealed in a short time...I hope you'll think it was worth the wait! There are still more secret projects in the works, but this one is really exciting (at least for me) and I can't wait to hear your thoughts on it. Ohhh, guess what I got in the mail recently? Flea Market Fancy! I found this Flea Market Fancy scrap pack on Etsy for a decent price and just had to have it! The pink daisy dots is a FQ and there are a few prints here that I didn't have already. I don't have a lot of FMF and I'm still missing a number of prints, but what I do have is being worked into the string blocks for my quilt. And in other FMF news, I found my missing piece of the green daisy dot, yay! I couldn't find it anywhere and found it behind the couch yesterday while getting some batting (I keep my batting in bags behind/under the couch). I don't know how it got there, but I'm very happy! The green daisy dot piece is the first I ever found (in a scrap pack at last year's Creativ Festival) and measures about 1/4 yard. I think I may hop into bed now with either some knitting or quilt binding because I haven't been feeling so hot for the past few days. It's pretty early here, but I think even just lying down for a bit will make me feel a bit better! Talk you all soon peeps! P.S. 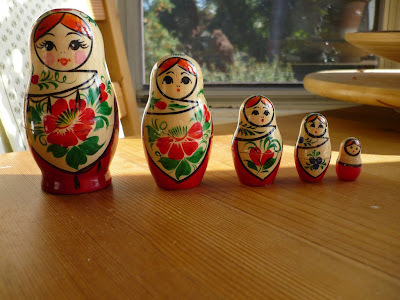 Did you see Melissa's most recent blog post? It's been a standing thing between John, Jennifer, and I that we need to get some t-shirts made with "Quilt Dad is my Homeboy" on them and guess what? Melissa delivered! Now Jennifer and I are just trying to figure out how to get ours to say "Fly Girl" on the back. 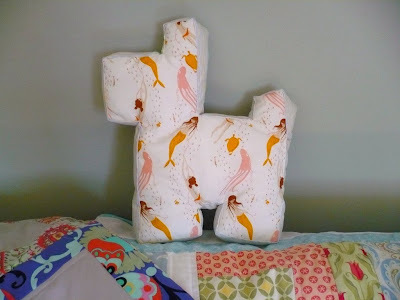 If you want to know the story, check out John's Quilt Market recap (the story is towards the end where the picture of Jennifer and I is). Oy vey, I started writing this post this morning before heading to work but then my laptop started cracking out again... so I'm getting a new one!!! Yay! Woot! And all that! My laptop is about 7 years old and was inherited last year from my bestie, Evan, when he decided to get a new one. I've piled a bunch of money into it in the past year (almost enough to buy a new one) and have about had it - the stress and anxiety of all it's problems was (literally) keeping me up at night and making me ill; I know that sounds over-dramatic, but as a graduate student I really need my computer to actually work. My new laptop should be here in about two weeks, but I'm crossing my fingers for sooner. Jennifer is pretty excited for me since I think she was disgusted with my laptop when she saw it at Quilt Market (it's held together with tape in some places). Okay, since I haven't heard from the winner of a second set of Kate's patterns, I'm drawing a new one! 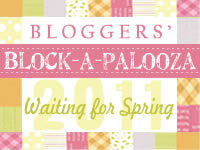 The new winner is... Krista of Poppyprint! Congrats Krista, send me an email and we'll get the ball rolling! I've been sewing up a storm the past few weeks, but unfortunately I can't show you what's been taking up the majority of my time. BUT I can show you this little beauty (the new addition) that I whipped up this week. Meet Sherlock Holmes! 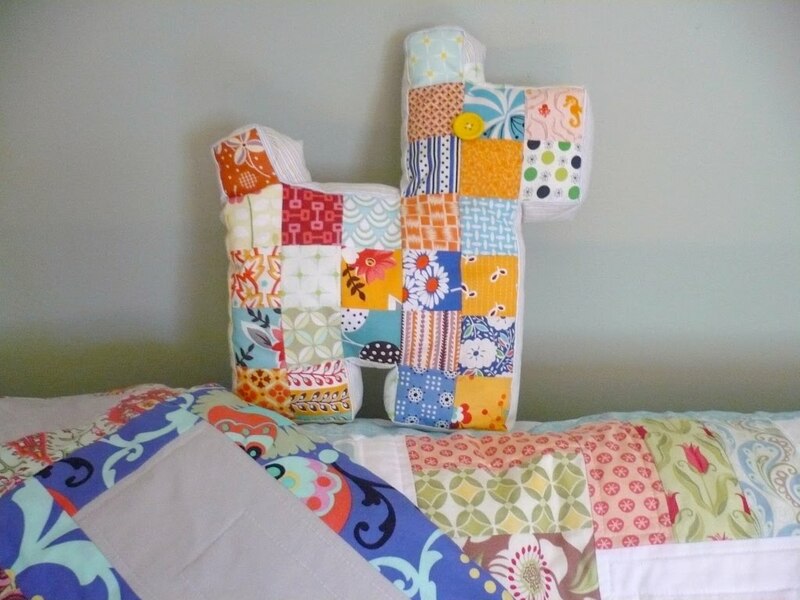 He's based on the free Scottie Dog pattern which can be found on Denyse Schmidt's site. 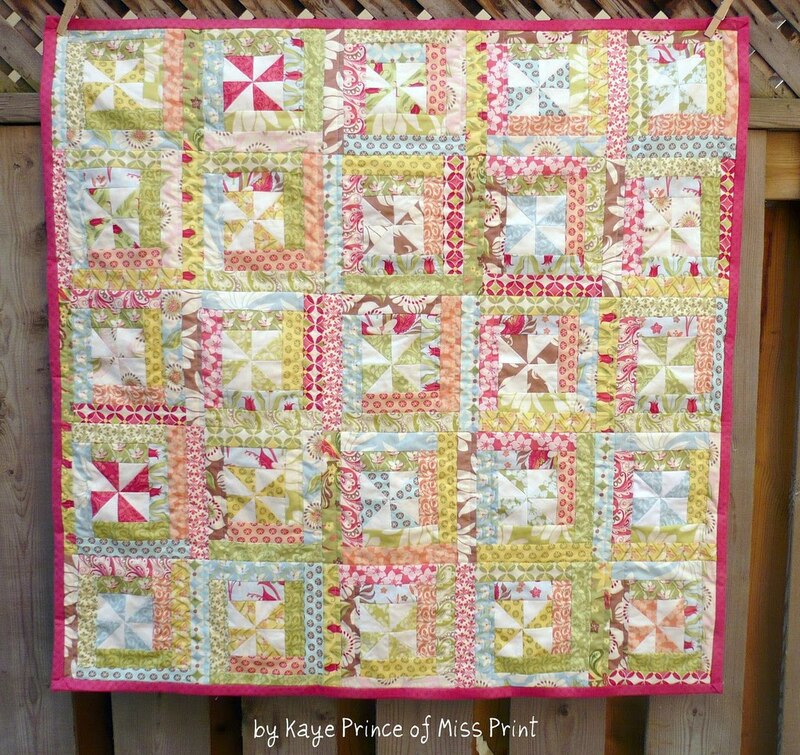 I made his front side using mostly a mix of Denyse's fabrics - Flea Market Fancy, Katie Jump Rope, and Hope Valley - there are a few other pretties thrown in there too just to mix it up a bit! Doesn't he look at home there sitting with Euclid and The Garden Path? Although the pattern says to make the back side patchwork also, I decided to do mine in a solid fabric - I put the front together first and then I traced it onto the Heather Ross Mendocino so that it would match. I love him! I really made him for Alex, but I like to snuggle him too! 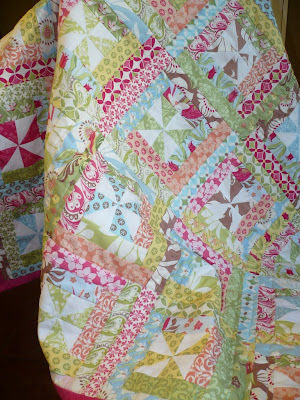 Okay, I'm off to quilt (again); I hope you all have a lovely weekend! I came up with this fun little tutorial as a way to use blocks made from my earlier tutorial (Pieced Centre String Quilt Blocks) in a small and colourful project! It was mentioned to me by a few people that they were going to try making blocks based on my tutorial, and I thought it would be great to share a project that didn't require you to make enough blocks for a whole quilt (which is what I'm doing right now and let me tell you - it is time consuming)! Enter the Pieced Centre String Block Coaster! Are you ready to get started? Woohoo! Okay, so to start: in order to make the coaster top (i.e. 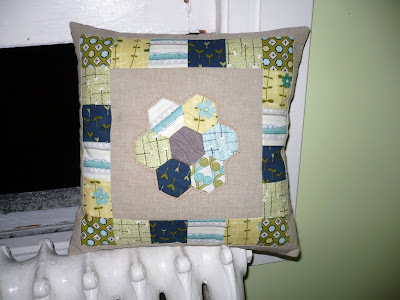 the string block) you will need to follow my earlier tutorial but with a few modifications. Here are the modifications - you will start with a 5" square paper piece (instead of 6.5"), the pieces for the centre strip will have a width of 1.5" (instead of 2") and your finished centre strip will end up measuring about 7.5" (instead of 9.5"). Are you still with me? 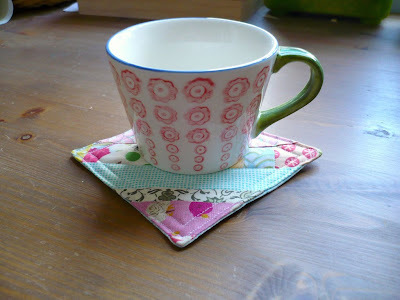 Everything else stays the same, but the modifications mean that you won't end up with a trivet sized coaster, teehee! This is what the block should look like. Be sure to give it a nice press (iron) before you continue so that it lies as flat as possible. Cut a piece of fabric for that back of the coaster that is 5" square, and a piece of batting for the middle that is 4 3/8" square. 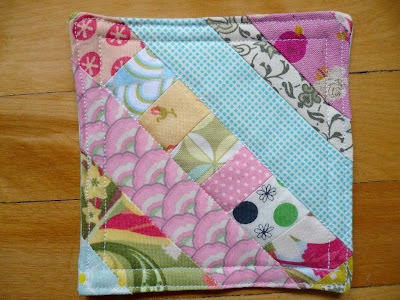 Place your string block and backing fabric right sides together and sew a 1/4" seam around three edges. Clip your corners, turn right side out and press. Insert your batting in the middle either above or below the seams so that it lies flat. Press again. Turn the open edges in 1/4" and press. Starting along that edge, topstitch 1/8" from edge all the way around. Continue quilting as desired. I did another line of stitching all the way around 1/4" from the first line, and then stitched in the ditch along both sides of the pieced centre string. (Sorry about the slight wonkiness in the 1/8" topstiching - my machine was just not into it today). So what do ya think? I hope you guys like it and that it will inspire your to try out my earlier tutorial without the dread of a full sized quilt hanging over you, teehee! And again, I'd love to see pictures if you make something using any of my tutorials!